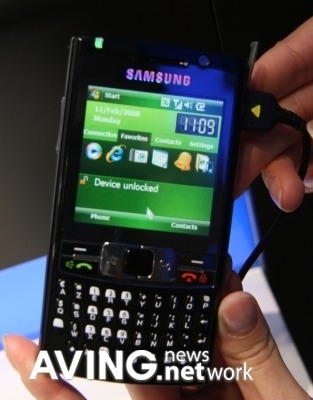 "Samsung Electronics unveiled its 3G HSDPA smartphone 'BlackJack III(model: SCH-M480)' dubbed as 'Ultra Messaging 2' in Korea market. It will be available in the mid of July through SK Telecom for around 600,000 won. Running on Windows Mobile 6 Professional, the SCH-M480...adopts a 2.6-inch touchscreen display with 320x320 pixel resolution, a BlackBerry style keypad and finger mouse. Other features included a 2M camera for video calling, MP3/MPEG4, WMV files support, and micro SD card slot." This appears to be a close variant of the i780 that's currently in Europe (and with a slated Fall release in North America).